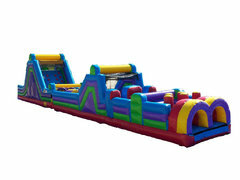 Obstacle Course Rentals, here in the center piece / main event piece for your party from Fun Times! 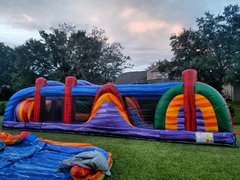 Our inflatable obstacle courses are great for birthday parties, graduations, school and church events or corporate team building events. We have lots of options and combinations starting with our Five Elements 30' obstacle course rental that is 30ft of racing, dodging and challenging excitement! The five elements that this unit boasts will make sure everyone is challenged. Want to add a fun twist? How about a relay race all the way down the course! Or we can take it up a notch with our more challenging 70' Eleven Elements Obstacle Course Rental, your guests will be surprised at the physical workout it and agility it takes to complete the course. But they will also enjoy the silliness and fun that an inflatable obstacle course brings. Bring families together and make some memories on our obstacle course rentals. But if you really want to push it to the limit then try our Sixteen Element 100' Obstacle Course Rental! Are you planning a party at the park and need power? We've got you covered! Click here and check out our generator rentals. Take your party anywhere! 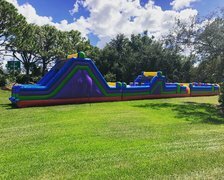 Fun Times Party Rentals is Central Florida's #1 choice for Obstacle Course rentals in Winter Garden, Clermont, Ocoee and surrounding areas.